If you were doubly disappointed by the Tampa Bay Rays' trade of Jake Bauers Thursday afternoon,the reason is simple. They traded both Jake Bauers. They traded Jake the symbol, the kid who was on the front line of the youth movement that is supposed to be the start of Tampa Bay's next successful run. They traded the nice swing and the great smile. They traded Willy Adames' baseball buddy. fact he was not a great power hitter. They traded lingering questions of if Bauers would hit enough to stay out of the minor leagues forever. The Rays looked at Jake the package Thursday, and decided they would rather have Indians' prospect Yander Diaz than the sum of Bauers part. It wasn't close. The Rays wanted Diaz so badly that they kicked in $5 million for Diaz and minor league pitcher Cole Sulser. That's a hefty price for a player who hit one home run last season. Diaz hit just one home run in 2017 and has 27 in five major league seasons. Whether he can challenge for at-bats at third base (where Matt Duffy, Daniel Robertson and Brandon Lowe will compete) or first (where the team has jettisoned C.J. Cron and Bauers) or DH will be seen. For the Rays, there has been heavy work to this offseason. They have shipped out Mallex Smith and Bauers, and they have brought in catcher Mike Zunino, Diaz and signed Charlie Morton to a free-agent contract. It depends. Can Smith continue to invigorate a lineup at the top? Can Bauers get his average to a respectable level? Is the team right on Diaz? Those discussions should carry fans through an off-season. One thing is for sure, the Rays have no problem trading anyone and there almost certainly will be additional moves. Bauers could develop and become a good hitter but it does seem like he has a long way to go and could even wind up back in the minors again so I don’t mind this trade. Bauers may have been a fan favorite but if he hits less than .200 the fans will quickly adjust. At least Diaz has a history of being a good average hitter even if he doesn’t hit for power. I’m just wondering who else the Rays plan on trading. Players are like commodities for this Rays Wall Street trained team of wheeler, dealers so anything is possible. My guess is they would like to trade Duffy because of his injury history, big raise in 2019 and having a lot of guys who can play third. Maybe they could find a switch hitter who can play infield, outfield and DH to give them the ultimate versatility option. I think Duffy, too. They need a slot for Robertson if Wendle plays second. Add in big money and health risks, and he’s a good bet. I wonder about Pham. I think he’s more moveable than Kiermaier. Maybe find a reliever who can serve as a closer? Wendle is the best third baseman on the team but he can play anywhere so that’s how the Rays will use him, all over. Pham is a keeper. Some money has to go to offense and they still have plenty of room to get a closer in the $7 million range. 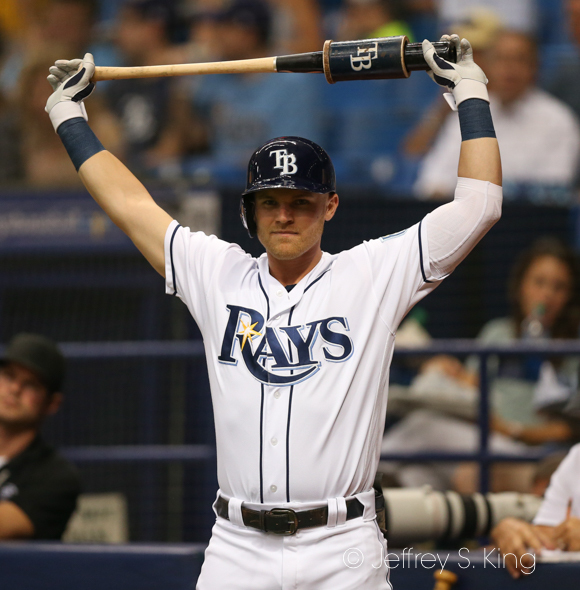 The Rays have to swallow their folly of KK’s contract. They overpaid for a guy with a great glove who can’t stay healthy and is mediocre at best at the plate. I don’t doubt your argument. I do think Duffy is most at risk of leaving. Previous post: Who has the edge when the Bucs play Jackson?